"Allison Gregory's art is playful and colorful at once, but at the same time serious fine art. 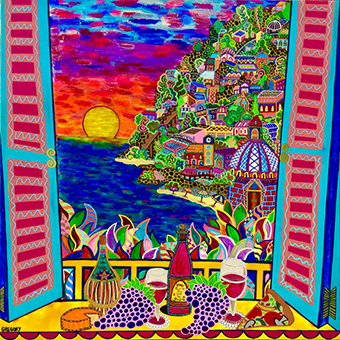 Viewers are drawn in by the bright colors and patterns, sometimes with raised textures, which often look like glass beads. This universal appeal to everyone’s senses is almost irresistible. Soon after the colors and textures catch one’s attention, one quickly becomes aware of the depth of her artwork. The masterful use of colors, the overall compositions, and the sheer richness of the patterns is an art connoisseur’s delight."